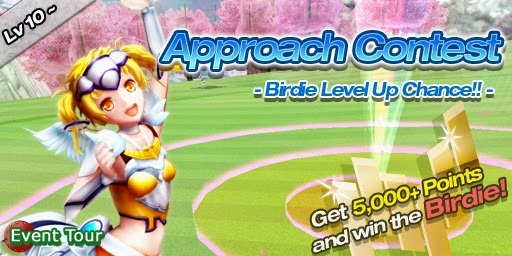 Mobblo:  Dungeons & Golf World - New event tours for April 23rd! Dungeons & Golf World - New event tours for April 23rd! Train yourself and overcome the water hazard ! Don't worry. Splite Golfy will guide you for every holes in this tour. 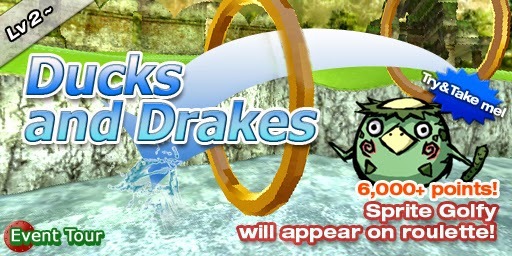 Everyone who gets 6000+ points will meet 'Splite Golfy' on the roulette! Here is a hint for anyone who think getting 6,000 points is too hard. Oh, and the winner of this tour will get Muramasa's Club Set! Get 5,000+ points and meet the cute Birdie on the roulette! The winner of this tour will get Angel's Club Set!